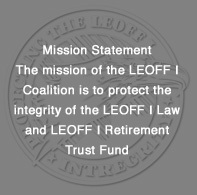 The mission of the LEOFF I Coalition is to protect the integrity of the LEOFF I Law and LEOFF I Retirement System Trust Fund and protect the LEOFF 1 Disability Benefits. LEOFF 1 Coalition members are law enforcement officers and firefighters. The LEOFF I Coalition is a non-profit 501(c)(5), non-partisan organization. Serving on the LEOFF 1 Coalition board is an opportunity for individuals who are passionate about the LEOFF 1 Coalition’s mission to contribute to its cause. Attend Coalition board meetings. The Coalition meets twice a year unless emergency circumstances cause the need to meet in person or via a phone to address emergency issues. Board members assist in carrying out the mission and communicating with their local state legislators about LEOFF 1 issues throughout the year. When the legislators are out of session, invite them to a local meeting or coffee. Serve as an advocate and engage with local LEOFF 1 members, LEOFF 1 Retired Law Enforcement and Fire Fighters on LEOFF 1 issues. Encourage Retired LEOFF 1 members and their spouses to join the LEOFF 1 Coalition to help protect their pension. Board members bring experience in many forms and leadership, including treasury, secretary, grassroots lobbying, helping members on issues with disability boards whenever possible. Attend LEOFF 1 meetings in your area and keep LEOFF 1 members informed on what the Coalition is doing.